VICTORIA FALLS, Jan 10 2012 (IPS) - Picking spots for cattle to graze could reverse desertification and even do its bit to retard climate change, new experiments in Zimbabwe have shown. It’s what is coming to be called the Brown Revolution. Planned grazing of livestock is helping restore formally degraded lands close to Zimbabwe’s Victoria Falls world heritage site. It is a miracle that ecologist Allan Savory of the Savory Institute calls the brown revolution – and at the least it could reverse the declining fortunes of agriculture in Zimbabwe. 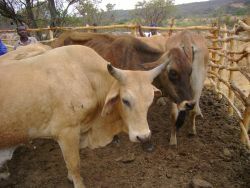 The U.S.-based Savory Institute and its partner organisation, the Africa Centre for Holistic Management (ACHM), have regenerated land, wildlife and water on land that was turning into a desert after livestock numbers increased by 400 percent on their 2,900-hectare ranch in the Dimbangombe area, 36 km from the town of Victoria Falls. The land healing miracle is thanks to a practice known as holistic management. Holistic management, a result of more than 50 years of research and development spanning four continents, has increased land productivity and water availability and improved livelihoods of communities in Zimbabwe through planned livestock grazing. With a wide understanding of the holistic approach and a quick response from government, Zimbabwe can devise a land and agriculture policy settling millions of people on restored land and ensuring the country’s return to its former agricultural fortunes. “Holistic management is more than just the holistic planned grazing – it involves a framework for such things as complex policy formation,” Savory said. “Agriculture is causing climate change as much as or possibly more than coal, oil and gas, and unless we address agriculture we cannot address climate change. We can say without any fear of informed contradiction that without using the holistic framework we cannot address some of the most significant parts of the climate change problem,” he added. Savory admitted that he never liked cattle. He said he used to be a “fanatical environmentalist” demanding that farmers get rid of cattle, based on his university training and prevailing beliefs. But decades later, he recognises that livestock are the only tool that, if managed properly, can change the direction of desertification, biodiversity loss and climate change globally. “By using livestock to mimic the vast herds that used to roam our planet, before humans began replacing them and their role with fire, we are healing the soils and allowing them once more to capture and store vast amounts of both water and carbon – leading to reduced droughts and floods and beginning to seriously address climate change,” said Savory, a former wildlife biologist and founder of the ACHM. Savory blames desertification not on the proverbial scapegoat – overstocking of cattle, sheep and goats – but on the way they are managed. Under holistic planned grazing, livestock are grazed in an area for a maximum of three days and not returned to the same piece of land for at least nine months. In the process, they use their hooves to break up the hard ground and increase soil cover with dung and trampled litter, allowing for better rainfall absorption and carbon retention in the soil. The temporary compaction also facilitates seed to soil contact for better seed germination. With adequate animal numbers, holistic planned grazing also eliminates the need for grassland burning, because annually dying grass parts do not turn grey and stale, necessitating the use of fire to ensure new growth. Fires throughout Africa’s grasslands are contributing more to climate change than the use of fossil fuels in some countries. “The miracle of this approach is that for the first time in history we are dealing with both the cause of the available rainfall becoming less effective (desertification) and with our inability to deal with social, environmental and economic complexity in normal decision-making,” Savory said. While it is fashionable to plant trees to address desertification and climate change, Savory warns that trees cannot store excess carbon from soil destruction, fires and fossil fuels – but the world’s largely ignored vast grassland soils can do so, safely. This is because every season that grass plants are grazed, they leave dead roots in the soil, adding to soil organic matter. Savory points to the miracle of holistic management in Zimbabwe on the land within the pilot site at the ACHM. Today holistic management is practiced by tens of thousands of people in many countries and contexts. Up to 12 million hectares of land are under the practice globally. Savory said some people have started taking notice finally, simply because obvious success in the end prevails over criticism of the idea. He said naysayers, some of whom published countless papers and books ‘proving’ that the approach does not work, were now returning to holistic management. This acceptance by academics has drawn international recognition for ACHM. The Savory Institute has teamed with the Capital Institute, creating a division called Grasslands, which invests in deteriorating land within the U.S. to begin restoring large areas using properly managed livestock for a high return to investors. The Office of Foreign Disaster Assistance (OFDA) within the United States Agency for International Development (USAID) has provided 4.8 million dollars for ACHM and the Savory Institute to scale up education and training programmes in the southern Africa region. The work of ACHM and SI has interested NGOs and pastoralists throughout Africa. There are ongoing successful operations in Namibia, Botswana and Kenya. The Savory Institute is collaborating with Kenyans to establish a learning site similar to ACHM to serve the Horn of Africa. Researcher and livestock specialist Prof. Ntombizakhe Mpofu told IPS that the holistic management approach is enabling farmers to manage their livestock to increase productivity while healing the land. And she explained that through the teaching at ACHM, villagers are now increasing crop yields by as much as five times using livestock properly managed for field preparation in place of ploughing and fertilising. Dr. Mike Peel, a rangeland ecologist with the Agricultural Research Council in South Africa, is monitoring and gathering data on land under holistic management over a five- year period to convince academics that its results are verifiable and not anecdotal. OFDA has agreed to fund the research because of the need for additional data to convince governments of the need for change. The Zimbabwe government has formed a permanent committee of the heads of appropriate government departments to work with ACHM to promote holistic management in the country. The United Nations Environment Programme (UNEP) 2008 publication “Africa: Atlas of Our Changing Environment” cited the erosion of agricultural land and deforestation among the most serious of Zimbabwe’s environmental problems. Savory points out that short-term answers lead only to decreasing livestock, cultural genocide for pastoral people and tree planting, while desertification increases. Developed as a result of the 1992 Earth Summit in Rio de Janeiro, the United Nations Convention to Combat Desertification (UNCCD) is a unique instrument that has brought global attention to land degradation. The Convention is now working closely with the Savory Institute to see if new thinking on land restoration can be introduced at the Rio + 20 conference to be held in June in Brazil. “Our most significant non-renewable geo-resource is fertile land and soil,” UNCCD executive secretary Luc Gnacadja told the UNCCD COP 10 in Changwon, South Korea in October 2011.